As I pour through the Talk to Me catalogue as part of the research for my upcoming MoMA course, Catalysts of Multimedia, I am struck by an emerging world of designed communications that has become common ground for the first generation of digital natives. Who are the digital natives? They were born in the 1990s when the Internet blasted into the mainstream via the birth of the Web. It was March of 1993, just twenty years ago, that the first Web browser was created by Marc Andreesen. Mosiac took the world by storm and today, the digital natives born in this time period have never known a world without the Internet. Imagine, never knowing a world without the personal computer, hyperlinks, routers, and all the rest of the pieces that make up our contemporary reality. We can only imagine what the millennial generation will be like, those who have never known a world without blogs, iPhones, and social media! Frightening? 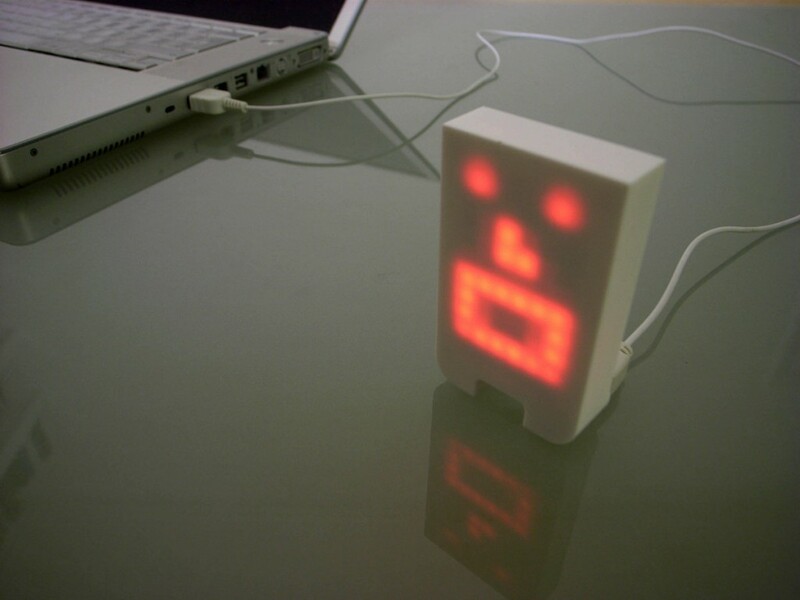 Tengu, an interactive toy named after Heavenly Dog, a mischievous supernatural creature from Japanese folklore, plugs into a computer’s USB port and reacts to sounds with its eyes and mouth, as if singing along to music or speaking when he hears someone speak. He requires no care from his owner – like the famous pet rocks of the 1979s – but he reacts when attention is paid to him. Tengu is part of the emerging design sensibility that insists that our objects communicate with us. Nothing new for child’s dolls, but in the world of telematics, everything is potentially in dialogue with everything else, a network of communications that links our objects together, an idea increasingly being discussed as the “Internet of things.” But Tengu doesn’t just talk back, Tengu is not a windup doll, rather, Tengu is connected to a computer, responsive to the environment, hears what’s going on around him, engages in real conversation, with virtual emotions to engage the digital native. In the 21st century, we will not only communicate with one another, we will talk to our objects, our computers, our phones, as Apple has pioneered with its semi-serious Siri. The digital native is right at home with objects that have programmed behavioral responsiveness. Perhaps they see Tengu in the same way they see their little brother, a parent, or a friend: another medium for communication, interaction, and play. Perhaps it is up to the prehistoric species of man, those of us who have known what it is like not to be tethered to a smart phone, to remind the younger generation of the effects of media. Or perhaps, as first generation natives of the digital, they will teach us how to adapt to an increasingly programmed world of cheerfully, networked things. Are we ready?